hi dolls! if you're anything like us, you feel down-right giddy this time of year when the air gets crisp, the leaves start to turn and the pumpkins begin to appear at the farmers market! we felt like putting a little bit of pumpkin love outside the shop yesterday and since our latest motto has been "everything is better with glitter", we decided to sparkle the sh*t out of these guys! this could be cute with so many different designs and an added bonus: no messy pumpkin guts or molding that comes with carving! we, of course, opted for the white pumpkins and chose gold glitter to decal them with. we're pretty sure any sort of modge-podgy glue would work, but we used our handy dandy yes! paste for this project. we (semi-sloppily) drew out our logo design with a gold marker just incase there were any sparse spots in the glitter. with a small paintbrush, we laid the glue over the gold design and then went to GLITTER-TOWN! we love our martha stewart glitter in yellow barite. we'd love to see what glittery goodness you guys come up with for your pumpkins! 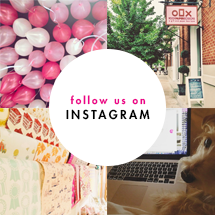 tag us on instagram @therockpaperscissors with your sparkly shots! Owning a stationery boutique comes with a certain amount of pressure when it comes to your little's first birthday. So, I knew when little Miss RPS turned one, a few years ago, i needed to pull out all the stops (which apparently meant crafting to the wee hours and hiding receipts from the hubby). I began with a color scheme of blush, mint and gold and the rest is history! first up, the invitations... the pressure!!! i designed the invitations, punched my very own custom confetti so the colors were perfect (who knew you could get a blister from a whole punch) and enlisted my friend heather from real card studio to foil them in gold. i then tucked a measured amount (yes, i'm ocd) into glassine envelopes, which i attached to each card and then sent them on their way! taking gold and pink circle stickers from waste not paper, I created a confetti pattern on the wall above the fireplace (and thankfully, they stayed up there and didn't peel any paint off when we took them down... phew). I then finished off the mantle with yards and yards of tissue garland I made, cardboard letters painted gold and sweet photos of Piper's first year. Is there anything better then a chandelier of honeycomb balls floating above the room?! Mr. RPS would say "sleep" would have been better, since he was on a ladder in the middle of the night with me saying "to the left, a little to the right, no go back" from below. You guys, my hubby really loves me, that's all i have to say! The one thing i was concerned about was where was i going to fit everyone! So we decided to move the living room furniture into the garage and rent farm tables, benches and vintage desks from southern events for the day. It gave us enough space for everyone to be comfortable and not feel like anyone was going to spill chocolate sauce on my white couch. Since then, we have done this for other celebrations, from birthdays to Easter dinner and it has been perfect. I even had my brother, who is super talented, make farm tables and benches for me that we store in the garage and can bring out for large parties. Best investment ever! Food, food, and more food! I really wanted to concentrate on all the little details of the party, so I needed the food to be simple but fabulously yummy. i decided an ice cream and hot dog bar (named after our beloved pup) was the perfect solution. We prepped tons of toppings, rented a soft serve ice cream machine and hot dog warmer and enlisted an extremely talented friend, astrid, who bakes specialty cakes to finish off the menu. let's just say, astrid really loves me, because her and hubby painstakingly made all the fondant confetti... even painted some of them gold. of course all the little paper accessories, are a must... so i designed coordinating labels and menus for all the yummy goodness we were serving. I'm obsessed with food packaging and ordered everything from french fry holders, hot dog baskets and ice cream containers to finish off the details from a restaurant supply store. I block painted and dotted plain wooden utensils with martha stewart craft paint and adorned pink dotted straws from our shop with handmade tissue poms. and because i firmly believed party hats were needed, i used metallic mint and pink paint on paper cones, holiday tinsel garland in gold to make the pom pom and fringe and glued plastic headbands on them so guests didn't have to feel too silly with yarn knots tied below their chins... that's just not chic! butcher paper is seriously one of those craft supplies, i think everyone needs. i spray painted gold stripes on mine and used it as a runner on the tables. i have serious anxiety worrying that guests will be bored at my party. so, i love to have a little activity for not only the kids but for the adults to do too. so, i set up a watercolor station with white board canvases and inexpensive watercolor kits from michaels arts and crafts and asked everyone to paint piper a little something for her to remember. it ended up giving miss rps such precious keepsakes from her party from friends and family. i made sure to tell everyone they didn't have to be an artist, we just wanted them to have fun and fun they did! 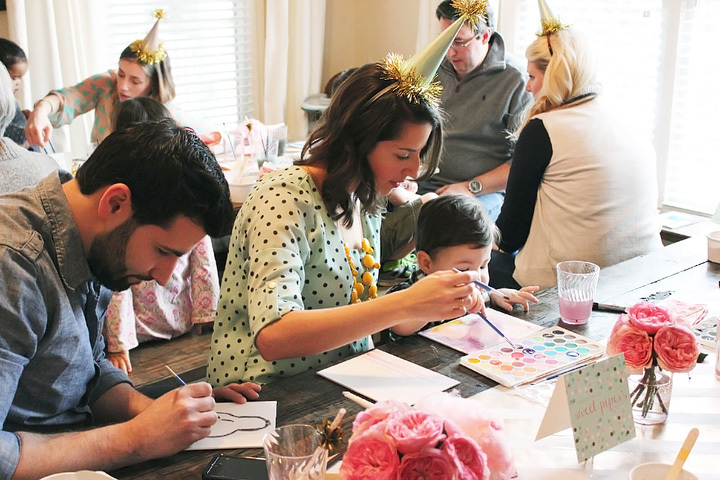 from self portraits, birthday cakes to landscapes... guests made the cutest paintings. my bff, dabney lee, painted piper a portrait for her first birthday. after i finished squeeling and tearing up at such a lovely gift, i quickly hung it on the wall before the guests arrived for everyone to see! i wanted to do something really special for piper for her first birthday. a keepsake from her mommy and daddy that hopefully she can pass down to her own children. so i wrote a children's book and then gave them as favors to everyone. I loved working on this project! after writing the story, i created story boards for the illustrator, who worked at the shop for a bit, and then sent them off to blurb to be printed. i'll need to share the whole book with you in another post! i can't believe this party was so long ago! Little MIss RPS will be 4 in a few months and there were tons of other celebrations along the way that we will share with you in the coming weeks! In case you missed the memo, unicorns are HOT HOT HOT right now! And even though I'm 29, (I am, it's the truth... are you calling me a liar?!) I can't help but love these little magical creatures. SURE IT MAY BE A LITTLE WEIRD TO WEAR A SPARKLY UNICORN SHIRT (IN PUBLIC, YOU CAN'T TELL ME WHAT TO DO IN THE CONFINES OF MY OWN HOME), I CERTAINLY CAN WRAP up a little happy TO BRIGHTEN UP SOMEONE'S DAY (OR MY DAY, I'M A SELFISH GIFTER). wrap and stationery available in our on-line shop! HI DOLLS! Welcome to our new blog! We were so sad to see our old one go (R.I.P. old blog, we loved ya) that we've decided to revisit one of our most popular posts, so it can live on forever in internet-land. Even though Little Miss RPS is 3 years old now, I'm still in love with the nursery just as much as the day I brought my wee one home. The minute I held that plus sign in my hands, I began dreaming of the space where she would lay her sweet head. I knew I wanted the room to be sweet, soft and soothing... a place to cuddle, read stories and sing lullabies. Quickly a color pallet of white and grey with touches of gold emerged with visions of baby animals watching over her as she dreams. Planning the nursery was a learning process for me. For one, I'm glad I went with my gut and did white just like I had wanted. Every time someone asked me what the nursery would be like, I would get the eye roll and "oh this must be your first baby" or "you will regret that." While it did make me think, it also solidified in my mind what the Mr. and I really wanted. I can honestly say, the white has never been a problem. So far, there is nothing that a little bleach and OxiClean haven't been able to clean (knock on wood). The room still remains much the same except for one toddler rail replacing a side of the crib and a plethora of Jelly Cat animals (so many, I don't know how the child even fits in there any more... baby girl has one serious plushie addiction). While holding back tears, I purchased a big girl bed and linens for Little Miss a few weeks ago. So you may catch me nostalgically staring at the following photos in the weeks to come. I'll be sure to show you how the room all pieces together once it is all finished (can we just talk about waiting 12 weeks for a headboard to arrive is agonizing)! So for now, I'll be shedding a little tear for my few remaining weeks with her crib, because I seriously adore it. I plan on squeezing myself into Little Ladies toddler crib with her and getting all weepy that my baby is growing up. sources: custom crib & changing dresser from DucDuc, photography by The Animal Print Shop and frames from Target, Cowhide Rug from Sunland Home Decor their one-of-a-kind collection, Mathilde Crib Bedding from Pom Pom Home, glider and ottomon in Washed Matelassé by Restoration Home Baby & Child, Animal Party Parade print by Rifle Paper Co., Sheep Rocker from Pottery Barn Kids, Giraffe head from Z Gallerie, weathered rattan baskets with liner from Restoration Home Baby & Child (no longer available), Window Rods from Restoration Hardware in Brass, Drapery from Restoration Hardware in Belgian Linen White, Tree Branch coat rack and Owl Lamp from West Elm (no longer available), Book Shelf from Serena and Lily (we had the book shelf custom painted when it arrived so the whites matched on all the furniture), Chandelier from Horchow (no longer available), Paint color is The Perfect Grey from Benjamin Moore.